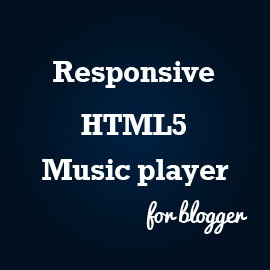 Hi Friends Today We are going to See how to add Responsive HTML5 Music player to our blogger blog. Generally HTML5 mp3/audio players requires Two type of files which is .mp3 and .ogg format. But In blogger we cant host files so we have to host our files in a external hosting like Dropbox which is a limited storage. In this case When we upload two types of music files (.mp3, .ogg) it consumes more space. So, To solve this problem I developed this New HTML5 Music player widget for blogger. In this widget We need only mp3 format to run this widget. so we can save lots of space. ok Let's see the advantages of using this music player. How to add this HTML5 Music player to your blog? To add the Widget to your blog Follow the steps given below. We had added the HTML5 Music player script to your blog. After that Now We have to display the widget. To add the Music player widget just paste The following code where you want to Display the playlist. If you want To add the single Music file in the Music player, Paste The following code where you want to Display the Player. Nice one. Will it slow the blog's loading time? But this only work with HTML5 template. And I got some request to you Chan deep. Can you make a tutorial how to change blogger template to HTML5? If it's so hard to make it HTML5. Yes Dude It only works with the HTML5 template. Most of the template released by Blogtipsntricks was html5. so you can use that templates. this one is Great. Does it support any other media files? Is it possible to customize the player's size so that I can fit it in a blog's sidebar? Also, will this work with the templates Blogger currently offers? I have blog related to entertainment, music. I will use this player of that blog. Nice post, how can I enable autoplay on this so as my playlist would play automatically after loading the page. How do I stop or suspend the playing? Can you do the same for videos that will play old flash videos no longer supported by anyone?